Patrick Madden of NPR member station WAMU 88.5 is the winner of the annual Daniel Schorr Journalism Prize, named for the respected NPR senior news analyst and veteran Washington journalist who died in 2010. The $5,000 Schorr award, sponsored by WBUR and Boston University, and funded by Jim and Nancy Bildner, recognizes a new generation of public radio journalists under the age of 35 seeking to inspire them to stretch the boundaries of the medium. 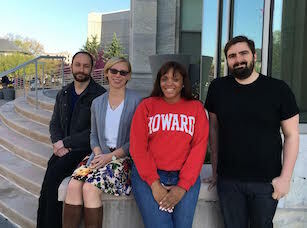 From left: Daniel Farber Ball, Ashley Campbell, Taylor Harris and Anthony Brunner worked as researchers and production assistants on the new program. A new PBS/NPR investigation, "Business of Disaster," examines why thousands of residents of New Jersey and New York are still struggling three years after Superstorm Sandy devastated their communities.